On those occasions when you need a side table for that party or a place to have dinner in front of the TV, the Boothbay folding tray table works great. 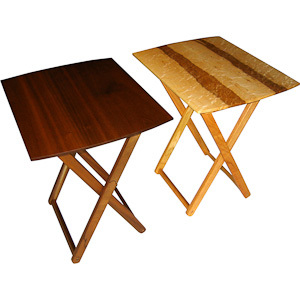 The tables shown here are crafted from Walnut and Birdseye Maple. Through wedge mortises are used on the legs to add strength provide a view of some fine handcrafted joinery. The top has a scalloped underside around the tabletop giving the appearance of a thin elegant edge. The unit easily folds to be stored when not in use. The finish is hand rubbed oil with a waterproof varnish for the top to give added protection. I like to use contrasting wood colors to add a different look to this very elegant table. Any combination of woods can be used for the top and legs. Please add 15% to the price of the higher wood and specify the primary wood species for the top.